Maison du Sud Location. 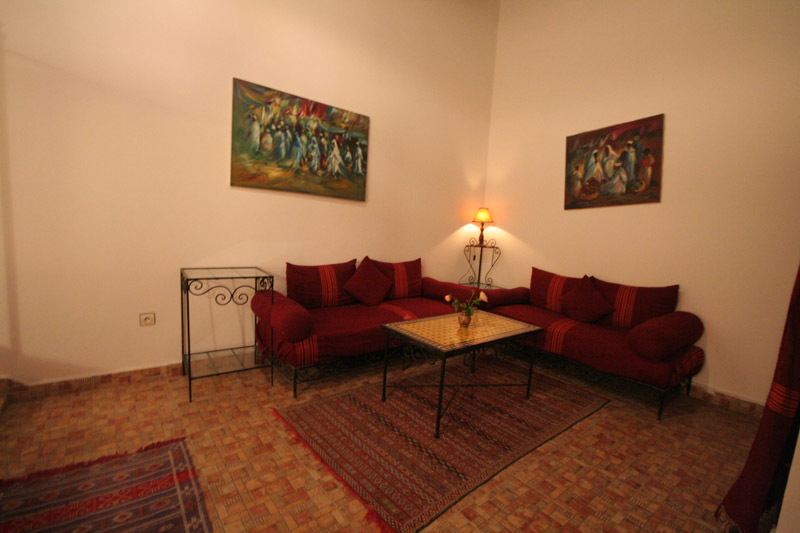 Book Maison du Sud Today with Hip Morocco - Holiday Accommodation in Essaouira , Morocco. 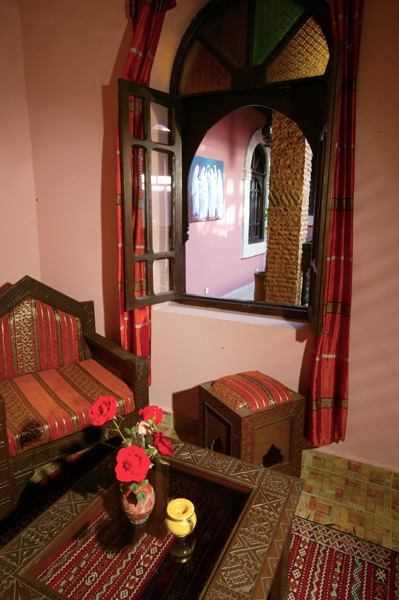 "Beautiful 18th century house for an authentic Moroccan experience by the sea"
A charming "residence", in the heart of the Medina, in a authentic Riad of the 18th century. 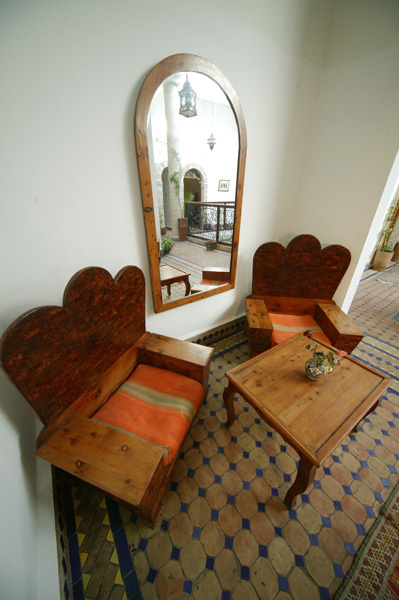 The large communal areas of Maison du Sud are authentically Moroccan with low benched seating areas surrounding the outside of the rooms. 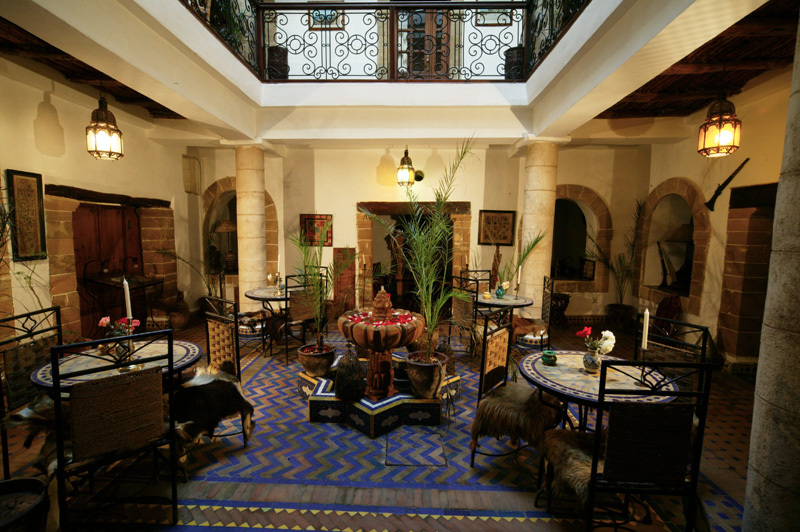 The central patio at Maison du Sud, with intimate tables and chairs, receives lots of natural light from the large open roof above. 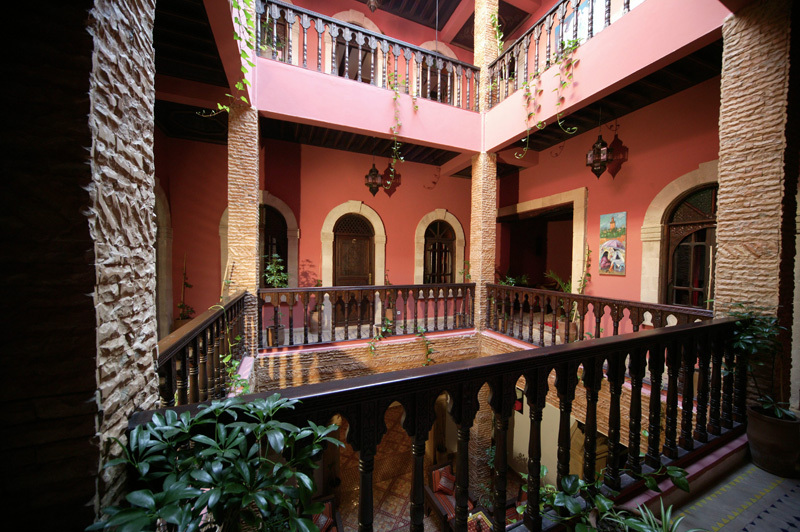 The patio is furnished with an abundance of green plants, central water fountain and a collection of very interesting colourful upcycled art pieces. 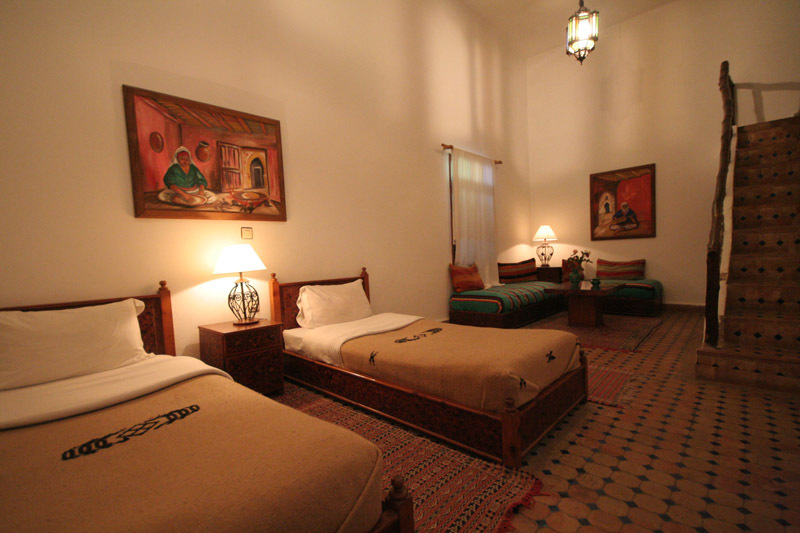 The rooms are neat and well presented yet basic in their furnishings. 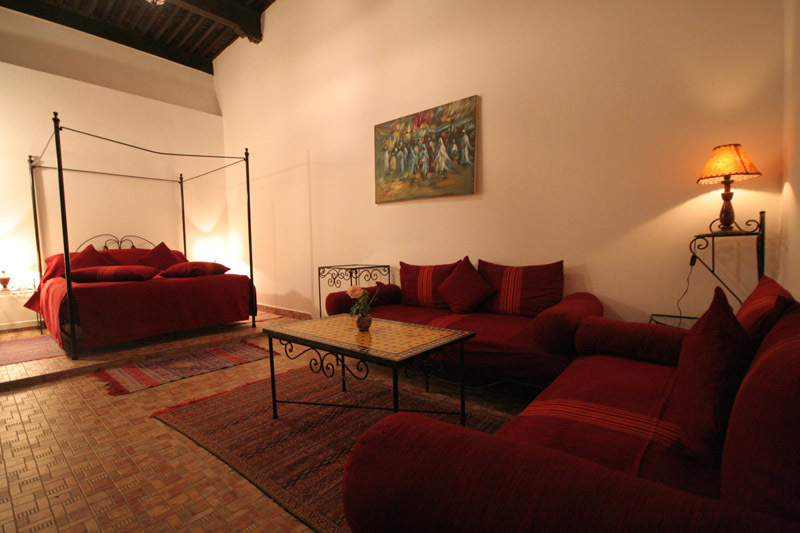 The rooms at Maison du Sud have high ceilings, larger ones have a sofa area which can be used for extra beds. 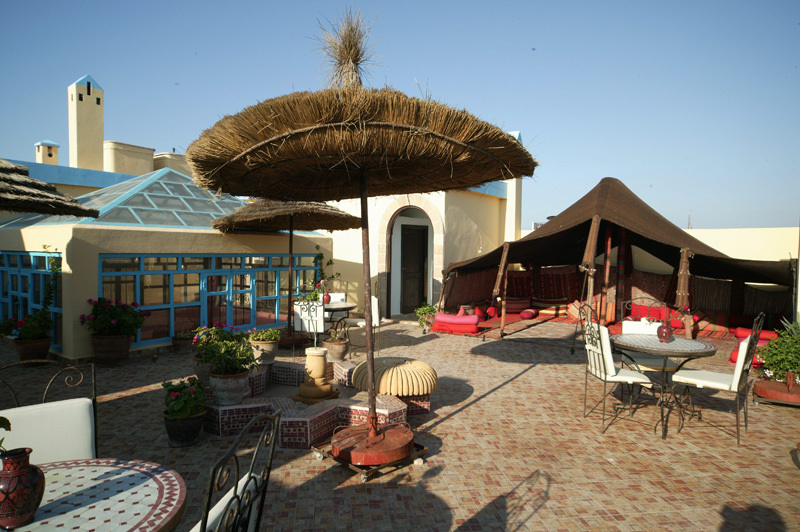 There is a good-sized terrace with tables and chairs to enjoy the sun and views of the town rooftops. 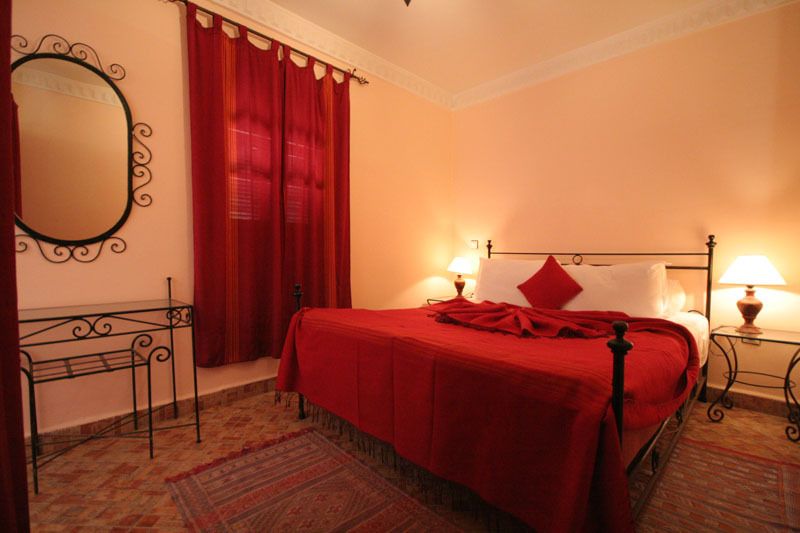 Maison du Sud offers 24 rooms. 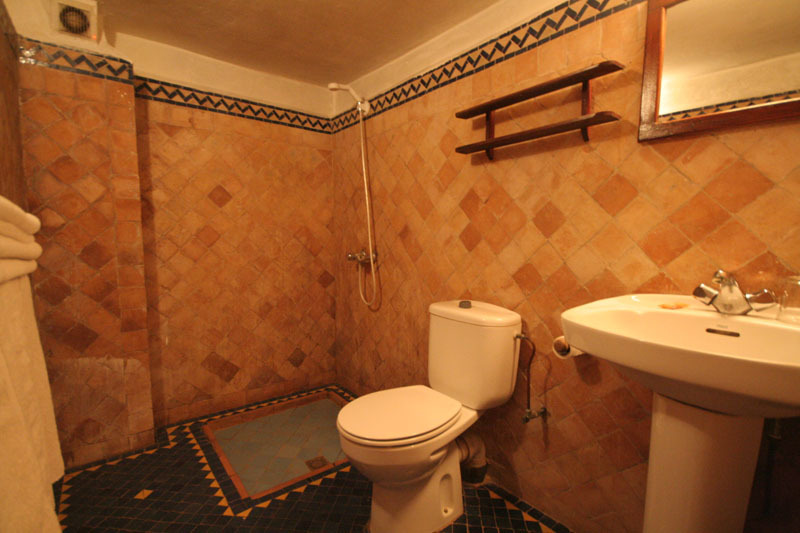 These have a bedroom with a small drawing-room and a bathroom, and are arranged on one and a half floors. 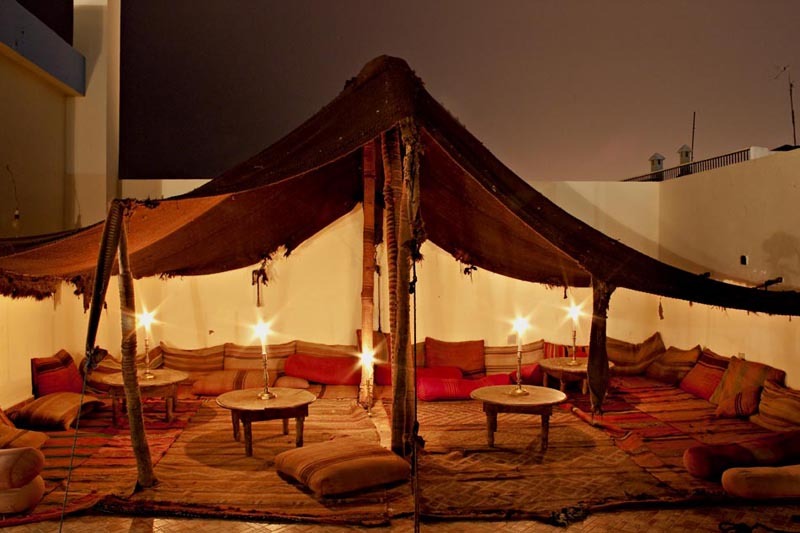 Through the traditional method of building, these are positioned around a large patio. 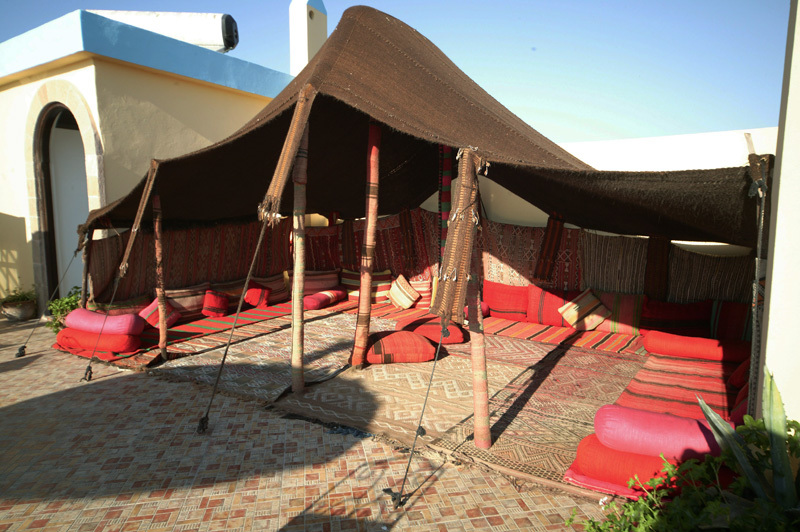 The simple roof terraces have a view over the white rooftops of the houses and businesses of Essaouira with the Atlantic ocean in the distance. 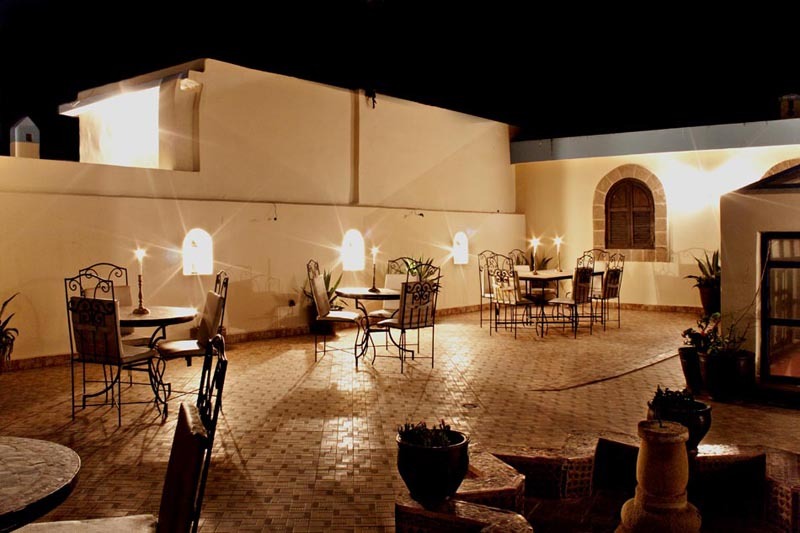 Traditional Italian atmosphere for this restaurant where you can find the best ( hand-made ) paste in Essaouira. At the end of the pier, you can see the boats coming in and out the port during the day and guess which one caught the fish in your plate. 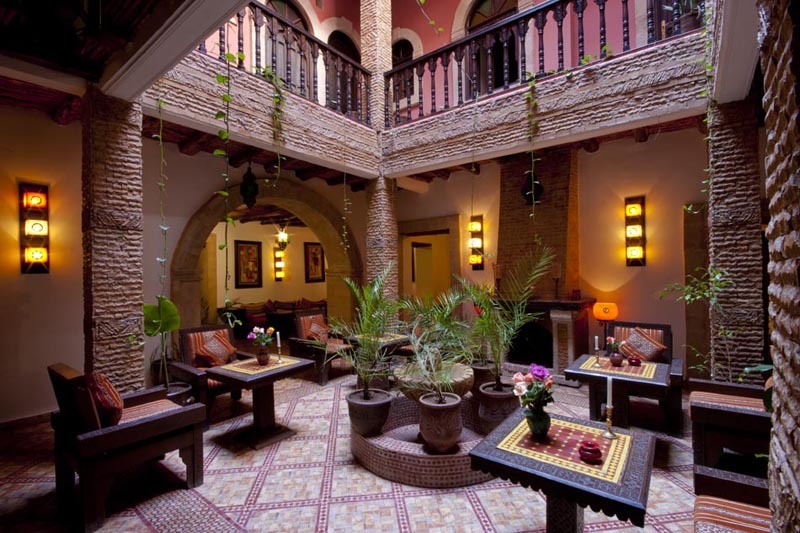 "This riad is quite big – it’s actually two ‘houses’ joined together – and situated right in the heart of the medina, you step out of the front door and there are shops all around you. Staff were friendly and helpful. 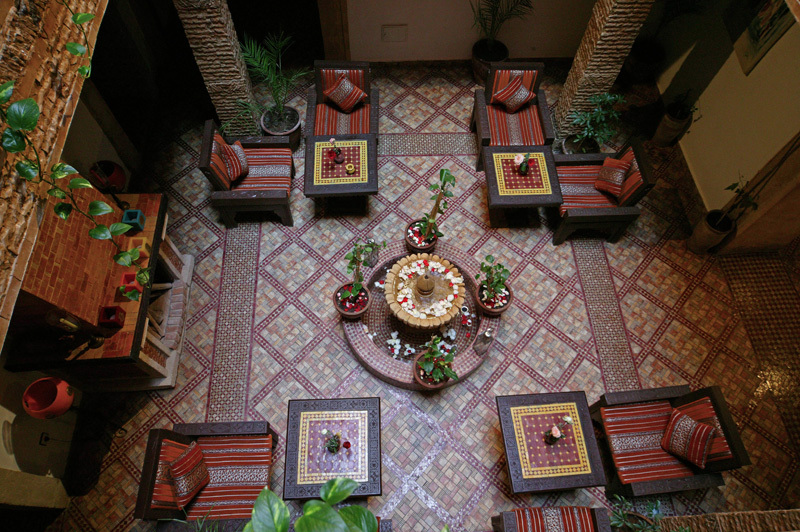 Decor was beautiful throughout the riad with pot plants and attractive lighting. Meals were good, small selection available for evening meals and very tasty. We took advantage of the hotel laundry service – in by 9am out by 6pm – and they did a lovely job, everything washed and ironed for a very reasonable price. 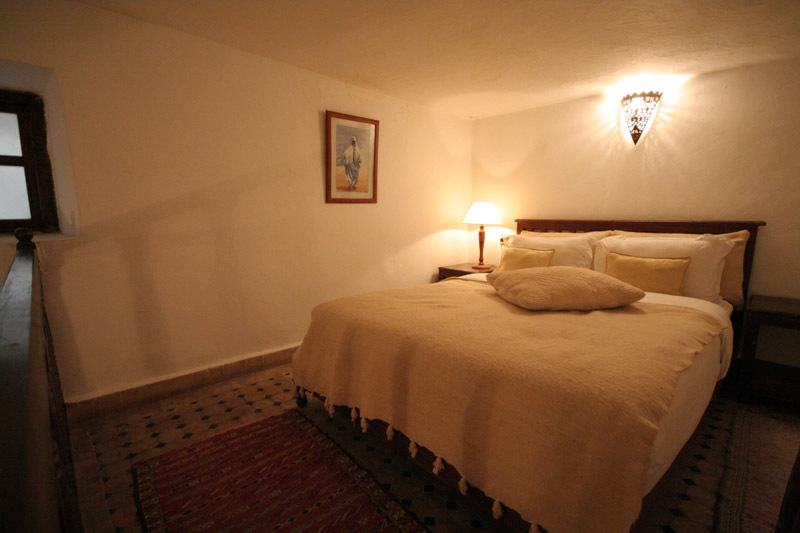 We were very taken with Essaouira and would definitely recommend this riad if you’re travelling to this delightful seaside town." 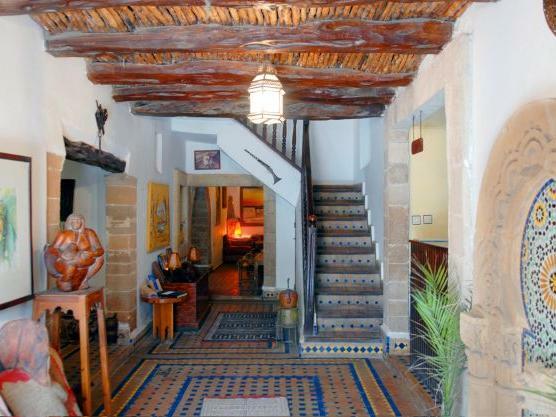 "This is a beautuful riad right in the center of essaouira medina. 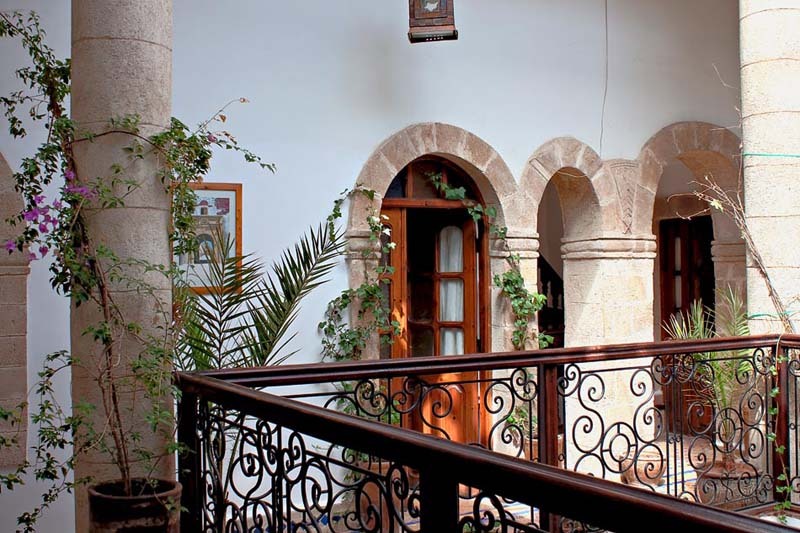 Its beautiful with loads of nooks and crannies and archways and little courtyards. we had a family room which was very spacious, twin beds one end, sofas the other end and a mezzanin floor with a double bed on." 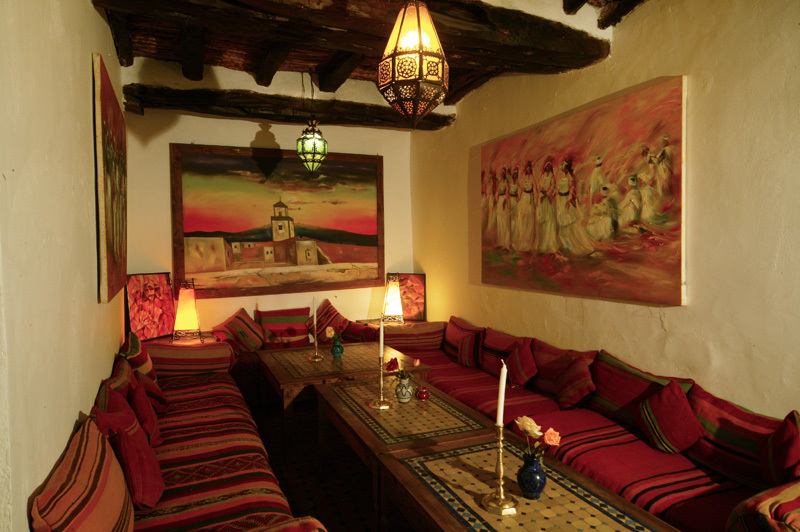 La Maison du Sud is located in one of the main streets within the walls of Essaouira's medina. 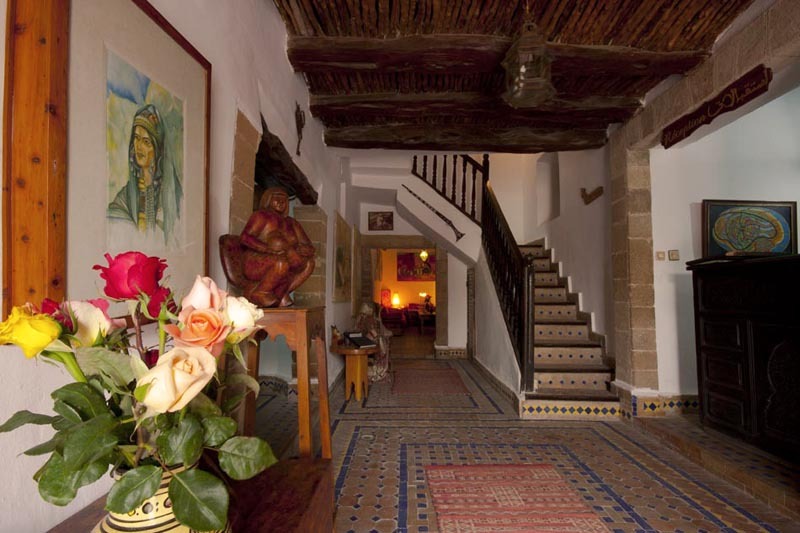 The beach, the fishing-port and the best restaurants in Essaouira are just a few minute walk. 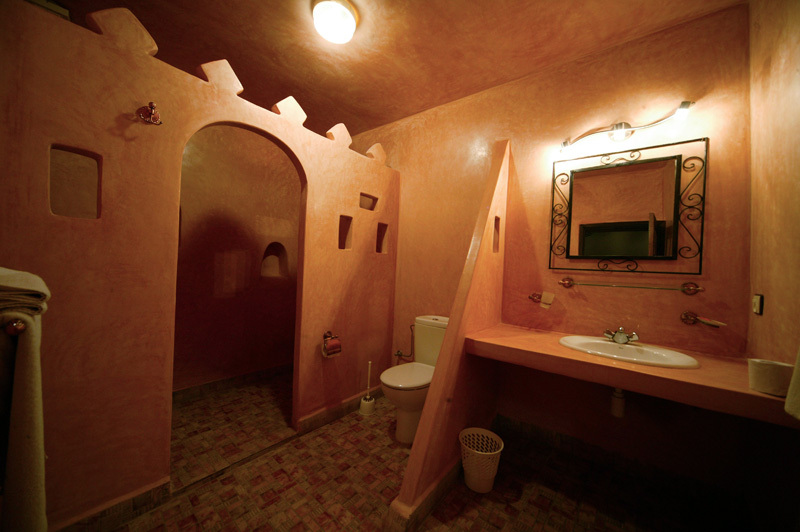 Double room with a large bed and a Moroccan lounge with ensuite bathroom. Views of either the street or the patio. 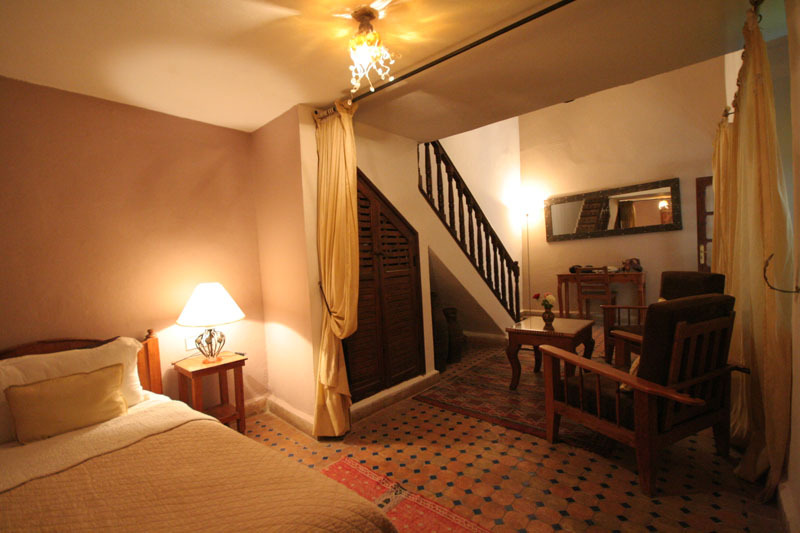 Riad Maison du Sud has 13 individually styled en-suite double rooms with sitting rooms, of which 11 are on a mezzanine floor. 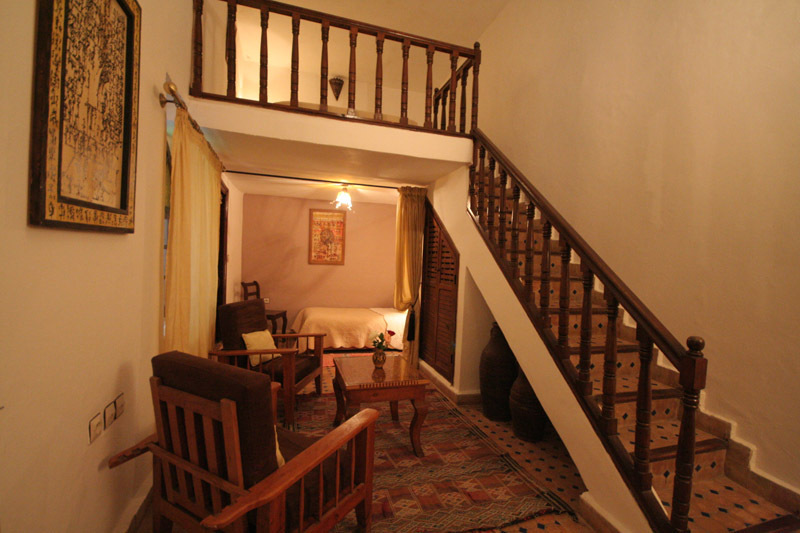 The 3 quadruple rooms at Riad Maison du Sud are set on two levels, stairs lead up to the mezzanine with double bed, and twin beds in the lower salon well suited for a family holiday in Essaouira. 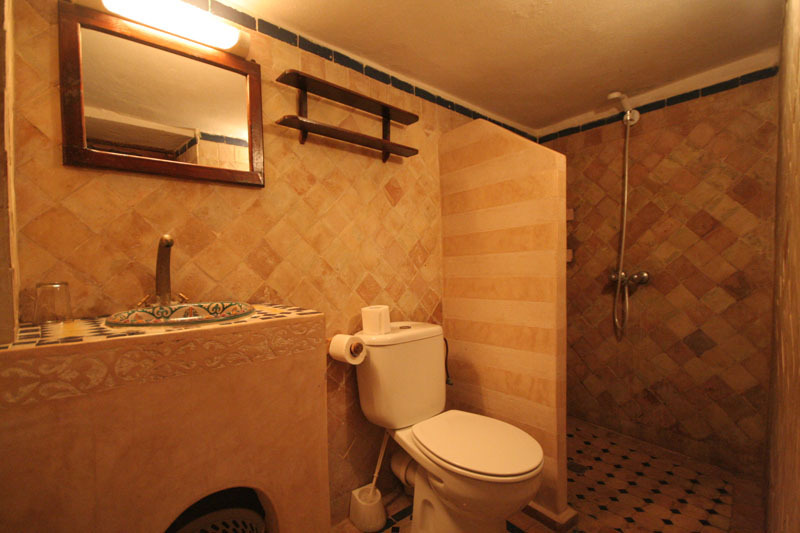 These room all have an ensuite bathroom and cosy seating area. 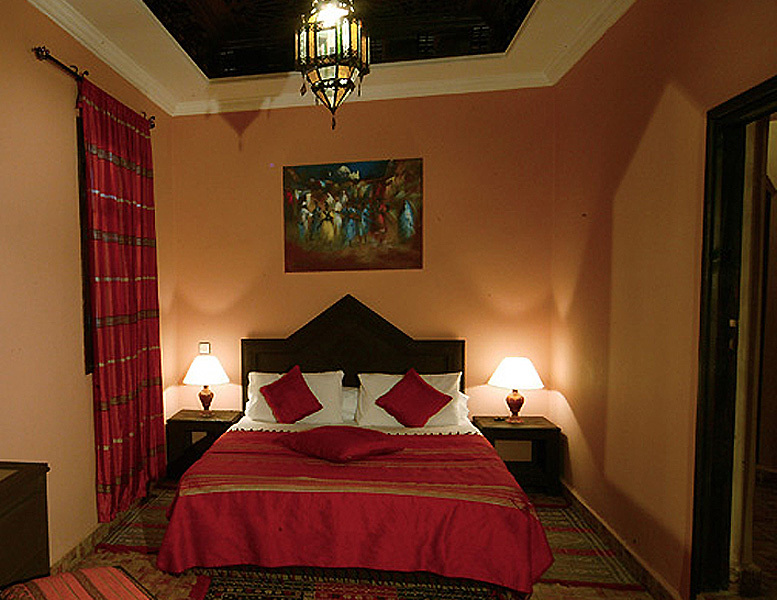 The spacious Mini Suite possesses a large bed and a Moroccan salon, with ensuite bathroom. 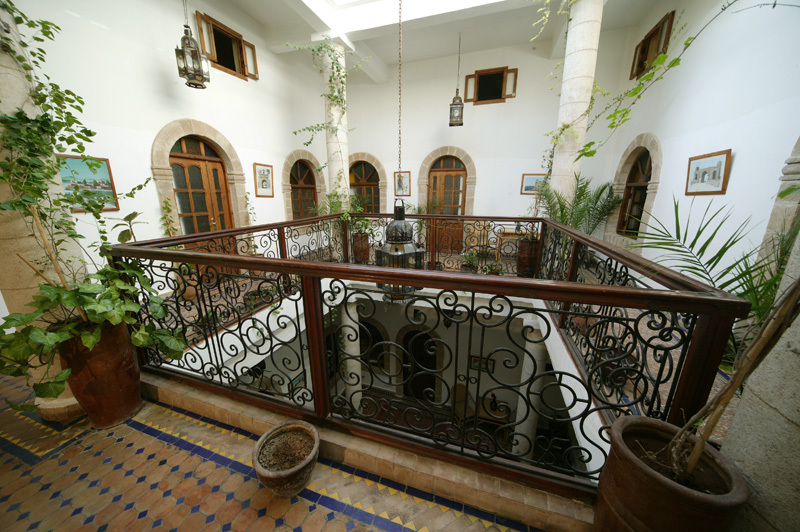 Views of either the street or patio. 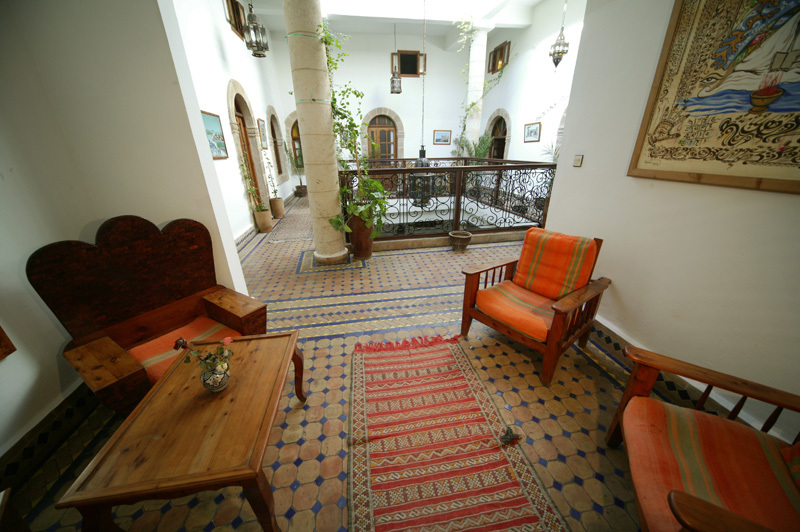 Riad Maison du Sud has 3 two-person suites all of which open onto a light-filled interior patio with traditional Moroccan tiling. 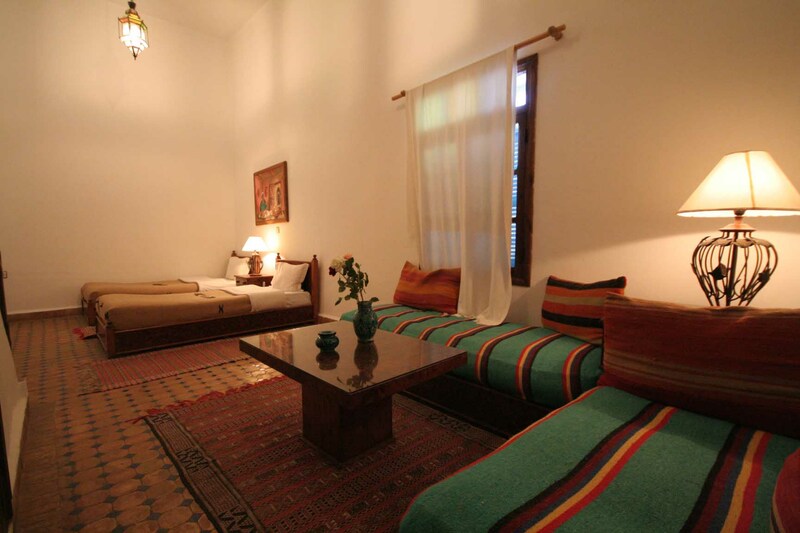 This spacious suite has a traditional Moroccan decor and offers a separated living area. 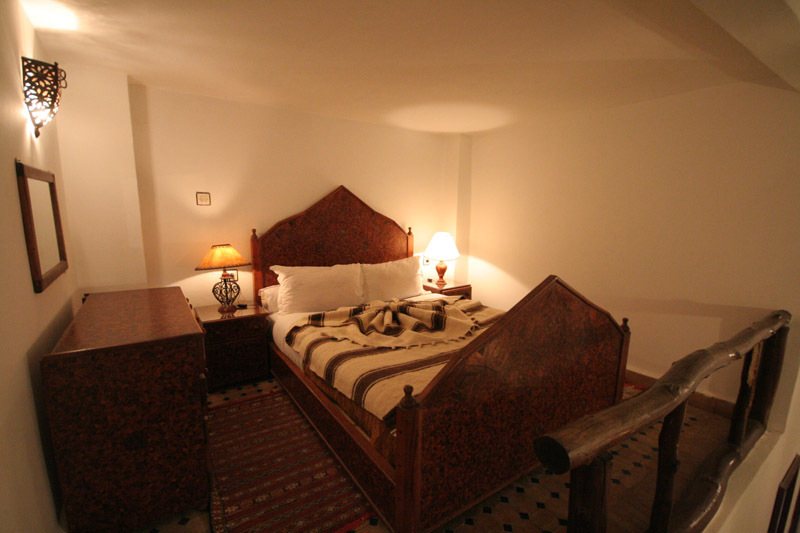 There are 2 triple rooms at Riad Maison du Sud which have a double and a single bed suited perfectly for small family holidays in Morocco. 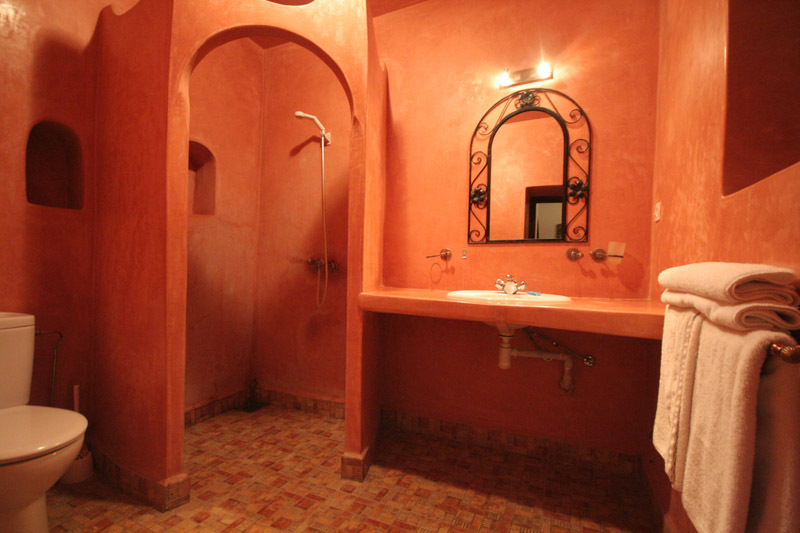 The triple rooms at Maison du Sud have good sized ensuite tadelakt bathrooms. 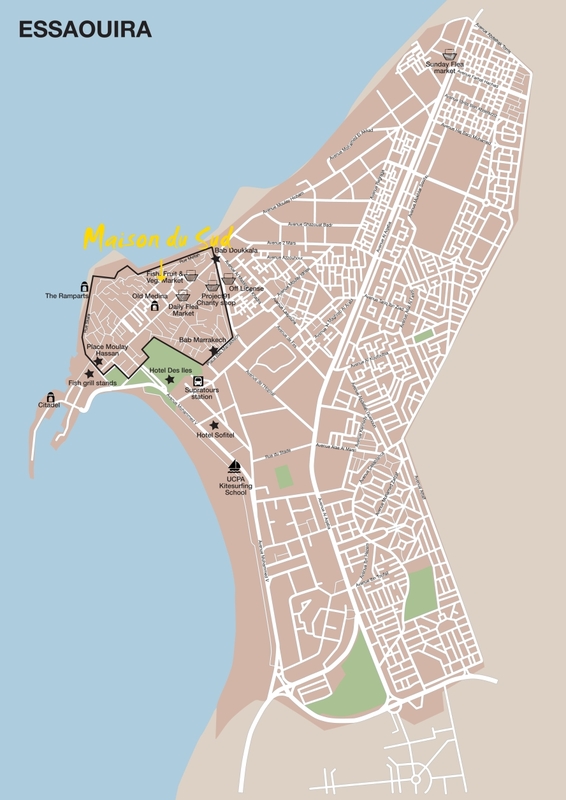 The base rate price at Maison du Sud is in pounds, euros, or Moroccan dirhams and exchange rates are approximate.